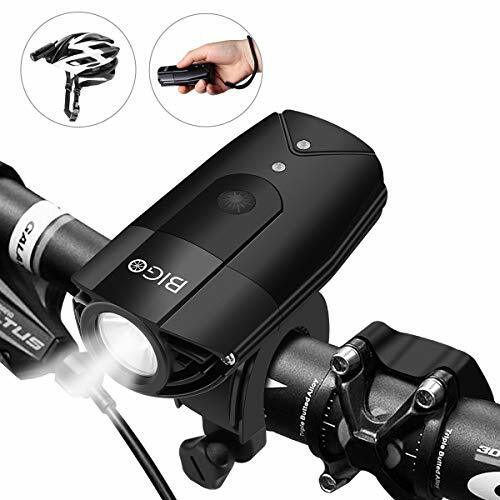 The BIGO bike light is a USB Rechargeable Touch Switch Bicycle Headlight, built-in battery & water resistant, with currently the safest polymer battery and intelligent touch control. Best choice for you! Enjoy your ride! Break the darkness with a powerful 1000-lumen and ride with 100% confidence using the BIGO Bike Light. Never worry again about riding in the dark! The BIGO Bike Light has three working modes: high mode, mid mode and flashing. Simply touch the control button to turn on the light and switch between working modes. A 2000mAh rechargeable battery provides up to 3 hours of use at maximum brightness. When the battery is out of power, connect with any USB charger to charge it back to full capacity. Never Buy Batteries Again! Easily mount to your bike handlebar or helmets. Also can be used as a standalone flashlight or emergency, illumination, rescuing, SOS light after removing the holder. The BIGO bicycle headlight is tested by CE, RoHS, FCC. If you have any questions about this product by BIGO, contact us by completing and submitting the form below. If you are looking for a specif part number, please include it with your message.